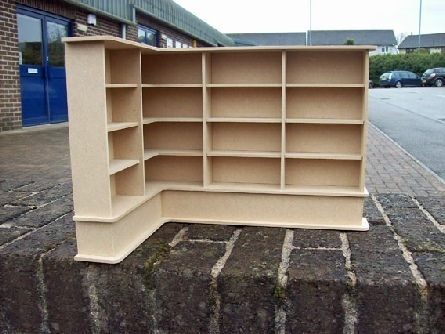 The new shop shelving kits are available to order. Designed and manufactured by ourselves. This is an easy slot-together shelving unit with easy to follow assembly instructions. The large shelving kits are specifically designed to fit into our existing Cafe-Bar- Shop Kit and the new Victorian Shop Box Kit. The medium shelving kits are designed to fit into our existing Starter Shop Kit. The medium wall shelving kits are designed to fit any of the shop boxes within our range. The shelving units are available either as a left corner unit (As per main image above) or as a right corner unit.